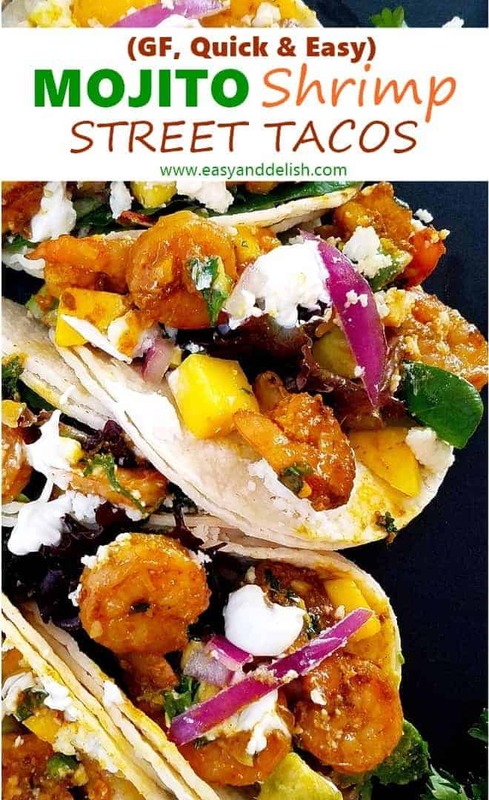 Quick and easy Mojito Shrimp Street Tacos filled with mojito-seasoned shrimp, salad mix, crumbled cheese, and a mango avocado salsa. A true GF champion for the palate and eyes! The Super Bowl will be held this Sunday, February the 4th. Amid all the excitement, it is great to have something scrumptious and quick to prepare that can really thrill a crowd. 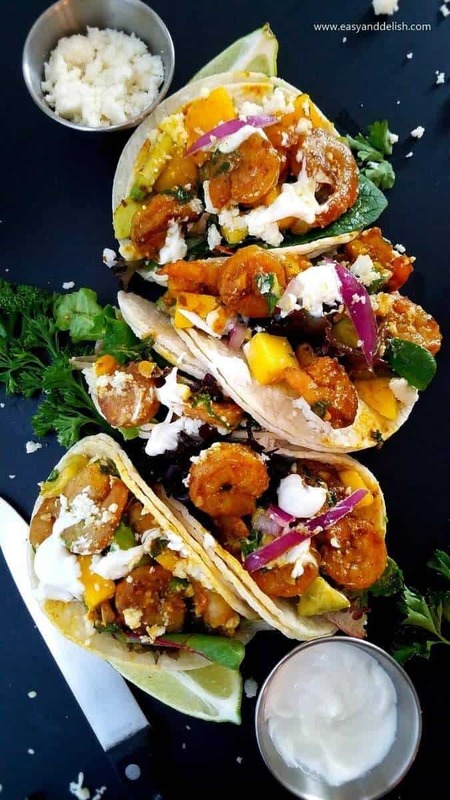 This year, we will be celebrating this event with these quick and easy, gluten-free Mojito Shrimp Street Tacos — a true champion for the palate and eyes! As you probably know, mojitos are traditional Cuban summer cocktail drinks made with fresh lime juice, mint, sugar, club soda, white rum, and ice. But this time, you are combining the main ingredients (lime juice, white rum, and mint) into a marinade to flavor shrimp. That’s right! 🙂 The very shrimp that will make our street tacos sizzle with a bold, super delish flavor. Besides the shrimp flavored with a mojito mixture and cooked to perfection, these gluten-free small white corn tacos are bedecked with a small bed of half and half mix (baby spinach, baby lettuce blend, baby greens, radicchio, and red kale), plus crumbled cheese and a mango avocado salsa. 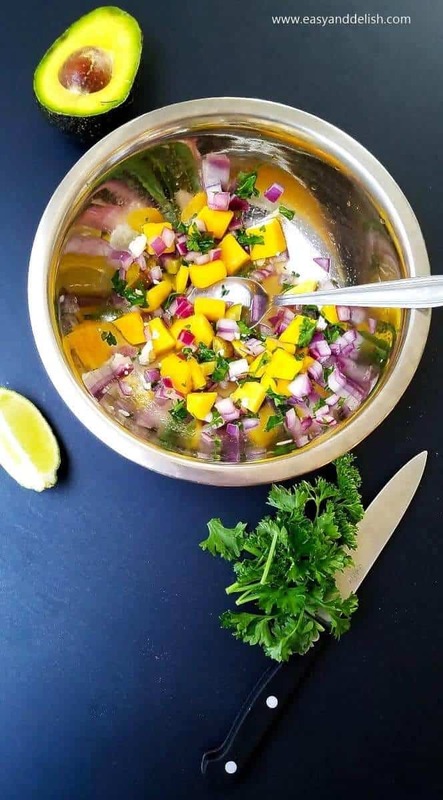 The mango avocado salsa is a flavorful and sensuous attraction all on its own– mango, avocado, red onion, cilantro/parsley, jalapeno, lemon juice, and salt make this salsa the perfect element to heap onto the shrimp. Both have kind of a Caribbean vibe! 😉 A kaleidoscope of colors and flavors. Definitely something to bring the heat to the game and fill your belly with joy. It just screams FIESTA! It is such a big event in the U.S. that it feels like a real party, right? 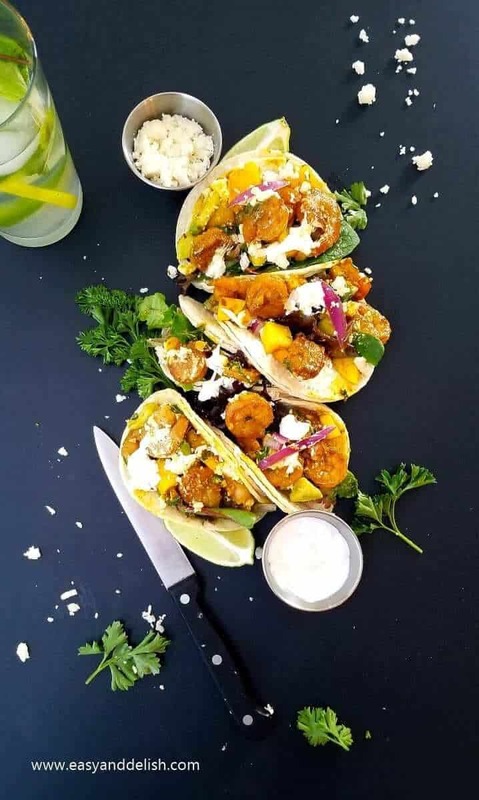 As a final touch, you could drizzle these Mojito Shrimp Street Tacos with sour cream and pair with a drink: a mojito itself, a super-chilled beer, soda, or any other drink of your choice. Cheers! For other Super Bowl appetizers, please check out our Palm Heart Bacon Bites and Avocado Cranberry Hummus Dip. I hope you have a very exciting, fun, and yummy Super Bowl!!! P.S. : Which team will you be cheering for? In a medium bowl, combine the mango, avocado, red onion, jalapeno, lemon juice, salt, and cilantro/parsley. Meanwhile, prepare the mojito shrimp. Season the shrimp with salt, pepper, cumin, and chili powder, mixing well. Add the mint, remove from heat, and squeeze the lime juice all over the shrimp. Toss the cilantro/parsley and arrange the tacos. 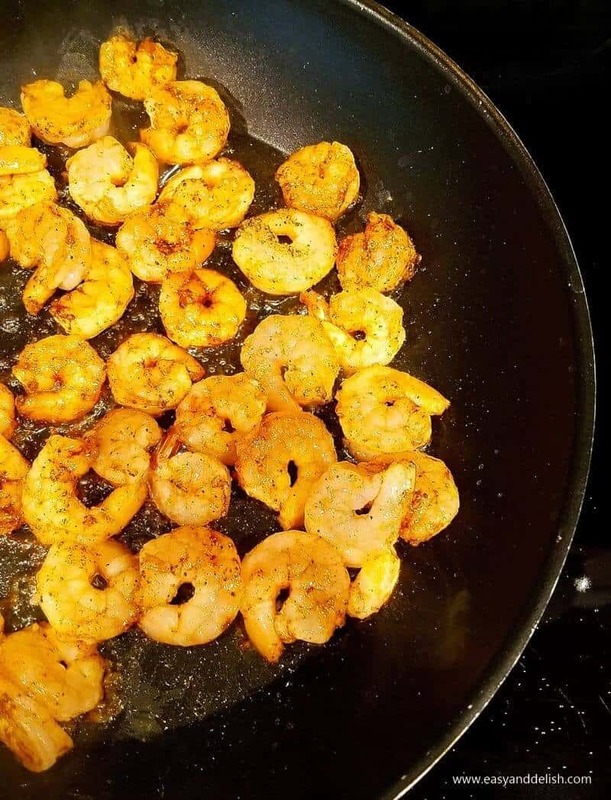 Then, heat a large no stick skillet over medium-high heat and add the oil and the seasoned shrimp. Cook shrimp for about 3 minutes. Add the rum and let cook until slightly evaporated. Turn it over, add the garlic, and cook for about 1 minute, stirring occasionally. Do not let brown! To arrange the mojito shrimp street tacos, place double tortillas (one on top of the other) on a flat surface. 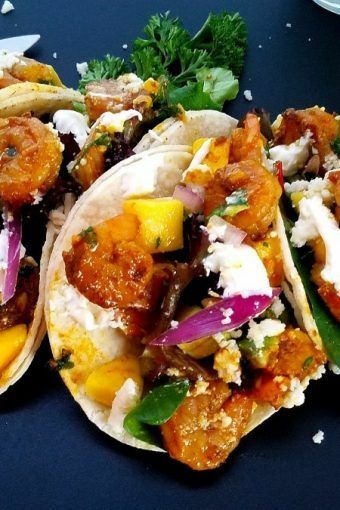 Fill tortilla with a bit of the leaf mix, spoon a bit of the mango avocado salsa on top, then the cooked shrimp, crumbled cheese, and a drizzle of sour cream. Repeat the process so that you end up with 8 street tacos. Enjoy! The double tortilla helps to prevent breaking, and spilling of the filling. I’m always looking for new shrimp recipes. It’s a personal favorite and oh so good! 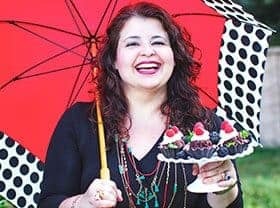 These mojito flavors really brighten up a winter dinner, fabulous Denise! This is definitely mouth watering! Love tacos, love shrimp, so you know I’ll love this. :- Thanks! Now this is my type of snacks!